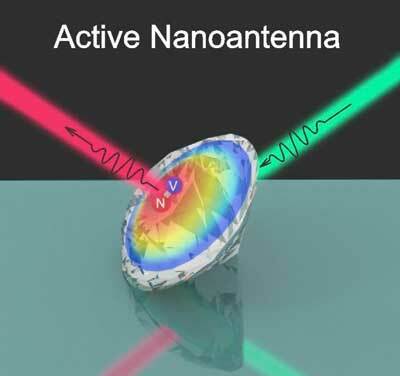 (Nanowerk News) A research group from ITMO University has developed a controlled light source based on nanodiamond. Experiments have shown that diamond shell doubles the emission speed light sources and helps to control them without any additional nano- and microstructures. This was achieved due to artificially created defects in a diamond crystal lattice. Obtained results are important for the development of quantum computers and optical networks. The work is published in the Nanoscale ("Purcell effect in active diamond nanoantennas"). In fact, experiments were carried out on nanodiamonds with multiple NV-centers. Even though the researchers also developed a theoretical model for the behavior of single photon sources in the diamond shell. Calculations showed that the speed of light emission can be increased by several dozen times. "Today getting a single photon from one NV-center in a nanoantenna is a rather difficult task. In order to implement such active nanoantenna in logic elements, for example, you need to manage their emission. In perspective, our concept will help to effectively manage single photon emission sources. It is very important for the development of quantum computers and optical communication networks," notes Anastasia Zalogina, lead author of the article, a member of the International Laboratory for Nanophotonics and metamaterials.